At bioMérieux we put customer needs first. 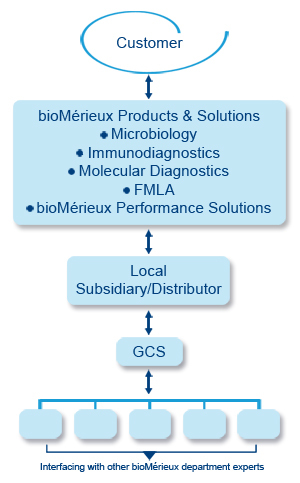 Every bioMérieux subsidiary and distributor has its own Local Customer Service to ensure support is close at hand. Our objective is to ensure you receive first class personalized service regardless of your geographical location. These local teams can rely on global level teams (2nd level support), which have an international vision of the in vitro diagnostics market, for extra support when required on instruments, reagents, information technology and service solutions. Each subsidiary and distributor has an extensive portfolio of products and solutions to offer you. They take into account specific country needs while benefiting from an international vision of the market. As your partner, our objective is to answer your key daily challenges and help simplify your daily workload. Contact your local subsidiary to see how they can help you. bioMérieux is committed to offering first class products and services to labs and healthcare professionals worldwide. By optimizing your working conditions we help ensure you provide rapid patient management and care.